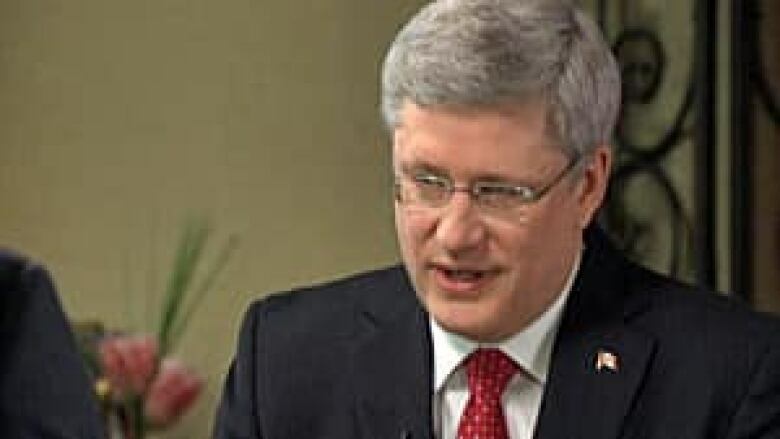 Prime Minister Stephen Harper believes decisions on expanding pipelines should be made by Canadians, he told CBC chief correspondent Peter Mansbridge during an interview. Any decision on developments such as the proposed Northern Gateway pipeline should be left to Canadians, Prime Minister Stephen Harper says. "It's one thing in terms of whether Canadians, you know, want jobs, to what degree Canadians want environmental protection. These are all valid questions," Harper said in an exclusive interview Monday with CBC chief correspondent Peter Mansbridge. "But just because certain people in the United States would like to see Canada be one giant national park for the northern half of North America, I don't think that's part of what our review process is all about." The $5.5-billion Northern Gateway project is a proposal by Canadian oil and gas company Enbridge to build two pipelines stretching 1,177 kilometres between the Alberta oilsands and the West Coast. The Northern Gateway would have the capacity to transport 525,000 barrels of oil per day. The CBC community reacts to Mansbridge's conversation with Stephen Harper. What's your take? Just before hearings on the project began, Harper and Natural Resources Minister Joe Oliver raised the issue of foreign money going to environmental groups earlier this month. The groups say they get a small amount of funding from outside of Canada and that the government is trying to refocus the debate when much of the investment in the oilsands comes from outside of Canada. "I don’t object to foreigners expressing their opinion," Harper told CBC News. "But I don’t want them to be able to hijack the process so that we don’t make a decision that's timely or in the interests of Canadians." Harper said news the Obama administration would delay a decision on whether to approve extending TransCanada's Keystone XL pipeline was a wakeup call about the degree to which Canada is "held hostage" to U.S. decisions. He has since pressed for Canada to seek out new markets in Asia. But while the government has made a case for Canadian oil as being more ethical than fuel produced in countries with poor human rights records, Central and Eastern Canada tend to buy oil from outside the country rather than from the oilsands. Harper said that is odd, but there's nothing the government can do about it. "We're really the only supplier that is secure and is increasing its production. So I think [being market-driven has] served the country well. It's served government revenues well. It's served creation of jobs well. But it is fundamentally a market-based decision. We don't dictate pipelines go here or there." Public sector pension plans: Harper says the government is looking at ways to bring them closer to private sector norms. "As an employer, we have to have a pension plan that is reasonable and attractive to get people into the public sector, but it should not be significantly more generous than what would be available in the private sector." The government also has to look at the pensions of parliamentarians, he said. Iran: Harper says it's "beyond dispute" that the country is trying to develop nuclear weapons, and that Iran frightens him. "These are people who have a particular, you know, fanatically religious world view, and their statements imply to me no hesitation of using nuclear weapons if they see them achieving their religious or political purposes." Aboriginal Canadians: Harper says significant change needs to happen, but it will be gradual. "My own experience is that it will not be grand visions and declarations that achieve these things. It will be moving forward one step at a time, as we've been trying to do on things like water, investments in education, obviously building of trust, you know, as we've done through the residential school apology, and endorsement of the Declaration of Indigenous Rights." P.O.V. | Should the Northern Gateway oil pipeline be approved?